As you know, I'm an extremely colour shy person - and the chances are if you're a regular reader, you are too! But that doesn't mean to say I don't appreciate bolder hues - and some of you have said you'd love to see more splashes of colour. So, who's up for some *bright* inspiration today"! If so, the Copenhagen home of teacher Trine Brunsvig has it in bucket loads! 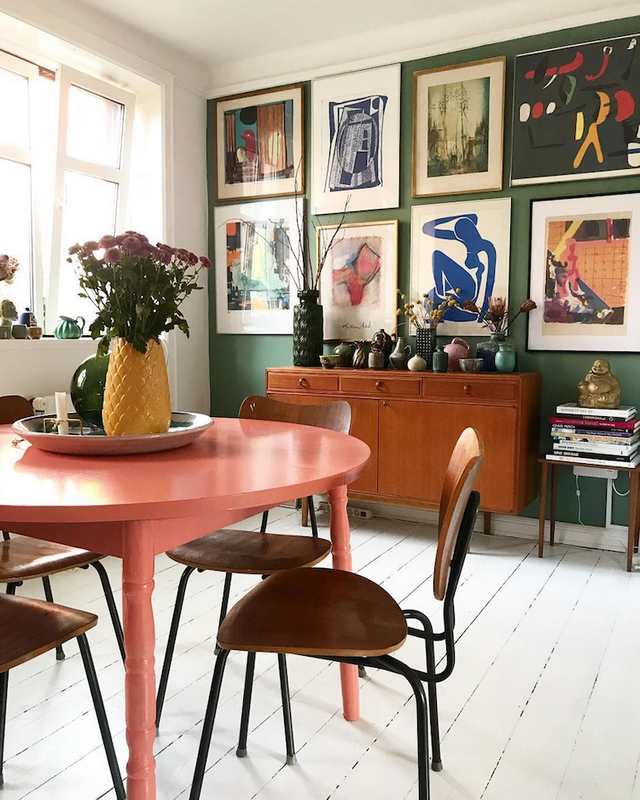 A self-confessed lover of music, books, ceramic, history, coffee, and dresses, Trine's home is a riot of colour with vibrant pink furniture, sunny yellow accessories, aubergine, green and blue accent walls and some fab vintage furniture! Here are a few snapshots from her world in the Danish capital! 2018 is the year homes have become more playful, and it's such a welcomed touch! The photograph of the pink storage crate with an LP under the CD's in this corner of the dining room deceives the eye for a mere moment - quirky and fun - I love it! Just North of Copenhagen you'll find Louisiana Museum of Modern Art - an incredible place overlooking the Öresund sea. If you're in town it's well worth a visit - and whatever you do, don't miss the shop where some of Trine's posters are from! Got to love a museum shop! Kind of fabulous! I love how personal and unique the space is. I'd really like to visit in person so I can get more of a hang of the layout, it's kind of tricky from these pictures.